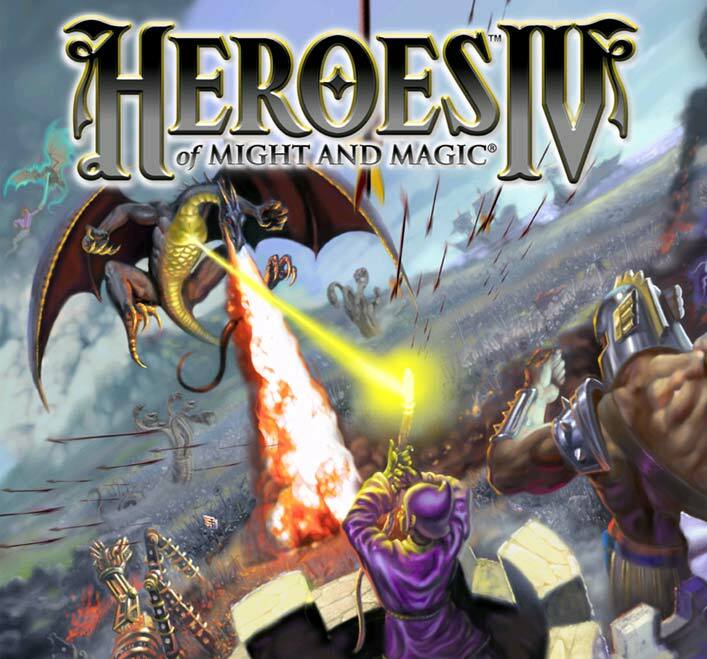 Heroes of Might and Magic 4 is radically different from Heroes of Might and Magic 3. Some of the major differences are: 3D perspective on the adventure map and on the battlefield, heroes now take part in battles along with their creatures, six towns with standardised graphic layout, no more creature upgrades, requirement to select between creature dwellings, addition of potions, heroes of the same type are identical, different primary and secondary skills system, more spellcasters among creatures, schools of magic are aligned with town types, creatures can walk on the map without heroes. Clearly, the intention has been to make a unique game, not a bigger and better Heroes 3. Heroes 4 was obviously underfunded - the game release was dellayed significantly, campaign scenarios only feature drawn pictures which often repeat between different campaigns, and the multiplayer feature was implemented only after the game release. Many fans were severely disappointed by Heroes 4, for many valid reasons. It caused a noticeable decline over the entire online Heroes community. The game has many great innovative features and a new graphics style. Each town type is quite unique from the others, having its own strengths and weaknesses. The game didn't become a major hit, but it is fun to play. Heroes 4 campaigns offer surprising philosophical depth compared to all previous Heroes of Might and Magic games - you can browse the campaign scenarios below to get a sense of this. Much of the story happens inside the campaign maps, so scenario descriptions and narratives are a mere overview. Choosing between two creature dwellings - both dwellings can be built only for level 1 creatures, from there up you'll have to make three choices from three pairs of creatures - on levels 2, 3 and 4. This way two towns of the same alignment can be very different. Heroes participate in combat - barbarian can become a creature-slaying machine, while a powerful mage can become an easy target without combat training. Heroes can be killed in combat. Towns can resurrect them. The enemy can capture defeated heroes and hold them imprisoned. You will then need to capture their town to rescue your hero. Heroes no longer have attack, defence, spell power and knowledge. Instead they learn primary skills, and then secondary sub-skills. There is great variety of skills that can turn your hero into a powerful battlefield unit, a great mage, a thief who can sneak past creatures on the adventure map, a governor that increases income and population, a general that boosts creatures' fighting abilities, etc. Towns now bring less income and there isn't a capitol building that generates lots of gold. Fortifications no longer boost creature population. Creature population happens daily rather than weekly. Creatures can wander the map, collecting resources and items and engaging in battles (but locations such as mines and towns can only be captured if a hero is present). Each creature has separate ratings for speed in combat and travel distance per turn on adventure map. Hero chains are impossible. Caravan structure can be built in towns to bring in reinforcements from other towns and external dwellings - arrival time will depend on distance. Caravans cannot travel blockaded paths. Also there's a neat button that lets you purchase all creatures in a town with one click. Like the developers said: It's all new Heroes. Period.